Looking down onto the dam from the hillside I could make out several ducks and the unmistakeable shape of a flotilla of ducklings. Lots of quacking and lots of splashing about. This was strange because ducks often frequent the dam but never with ducklings, and they fly off well before I get there. But with ducklings what would they do to hide from me?? When I got to the dam the ducks were nowhere in sight. 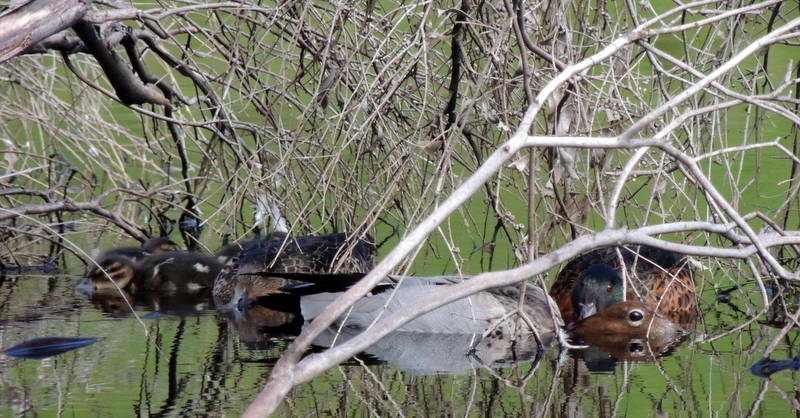 After a careful search I found them hidden in the branches of a fallen tree in the dam (above) – a male and female Chestnut Teal (Anas castanea) and a female Australian Wood Duck (Chenonetta jubata) with three chicks. Several things were unusual. First, they were completely silent, including the ducklings – very well trained. Second, I could not quite make them out because they weren’t ‘duck-like’ in shape. I know as a bird watcher and a hunter (with a camera) of animals through the bush that very often it is an unusual shape in the landscape that triggers me to observe that something is there, rather than the direct recognition. This ability we have to recognise shapes rather than objects is the reason for example army clothes and vehicles are camouflaged in khaki, dark green and brown patches – the colour hides the subject and the patches break up the shape of the person or vehicle and therefore makes it less recognisable. Even though I could tell the ducks were in there I couldn’t recognise a shape. The adult ducks held their heads out in front of them submerged up to the eyes and nostrils. And the ducklings were doing the same. 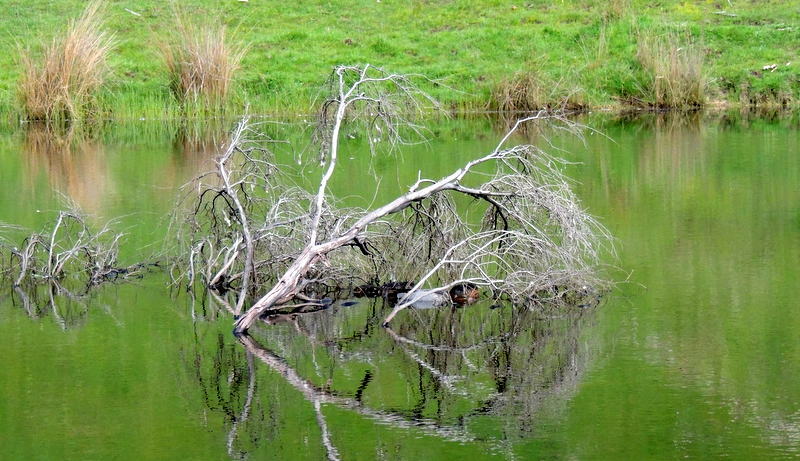 Their shape was more like floating wood than duck and therefore in between the branches they were very difficult to see. Maybe I am making the explanation up but I have never seen ducks sit like that AND they were hard to see. That’s very interesting, Ron. So you’re suggesting that when they can’t fly because of ducklings they adopt a stone-curlew-like camouflage pose. That Wood Duck looks very deliberate and guilty. I agree, the Wood Duck does look deliberate and guilty. The pose was unusual and made working out the shape of the duck in amongst the branches very difficult.